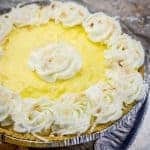 A few simple ingredients and a few minutes are all you need to create this fabulous Easy Coconut Cream Pie! You can use any open star tip to create pretty piped flowers around the top of your pie which really puts it over the top! Beat pudding mixes and milk in large bowl with whisk for about 2 minutes, or until it's very smooth. Stir in 1 cup of whipped cream and 3/4 cup coconut. Pour whipped cream mixture into crust. top of the pie and then one in the center. Sprinkle with remaining toasted coconut. Chill until ready to serve.